Solid joinery and turning, elaborate rococo carving, and handsome woods are hallmarks of the finest early American furniture from Philadelphia. In collaboration with the Center for American Art at the Philadelphia Museum of Art, Winterthur’s annual Sewell C. Biggs Furniture Forum, held March 5 through 8, focused on Philadelphia’s 18th- and 19th-century furniture and material culture. Below are a few highlights from the sold-out conference—which included more than 300 attendees, including 13 scholarship recipients; 23 presentations by senior and young scholars, dealers, and collectors; and behind-the-scenes tours of the Philadelphia Museum of Art, Winterthur, and Philadelphia historic houses Stenton and Mount Pleasant. One specifically interesting lecture from the many presentations was from Laura Keim, Curator, Stenton and Historic Germantown, who presented new work of the iconic Blue Book of Philadelphia furniture, which put into perspective what collectors can trust from the publication and what warrants more scrutiny. Conference attendees were also very interested in the presentation by Alexandra Kirtley and Peggy Olley, whose lecture “A New Radiance: The Latrobe/Bridport Furniture Revealed” offered insight into the furniture of Latrobe and Bridport from the perspective of both curator and conservator. The conference speakers emphasized that while experts know quite a bit about certain aspects of Philadelphia furniture and its makers, there is much left to discover. Along the same theme of new exploration, there was an emphasis by many conference speakers on the influence of German and other non-English makers and users of furniture in Philadelphia. Speakers discussed the diversity of Philadelphia furniture and the importance of studying influences from the Irish, Scots, German, French, and other furnituremaking traditions. 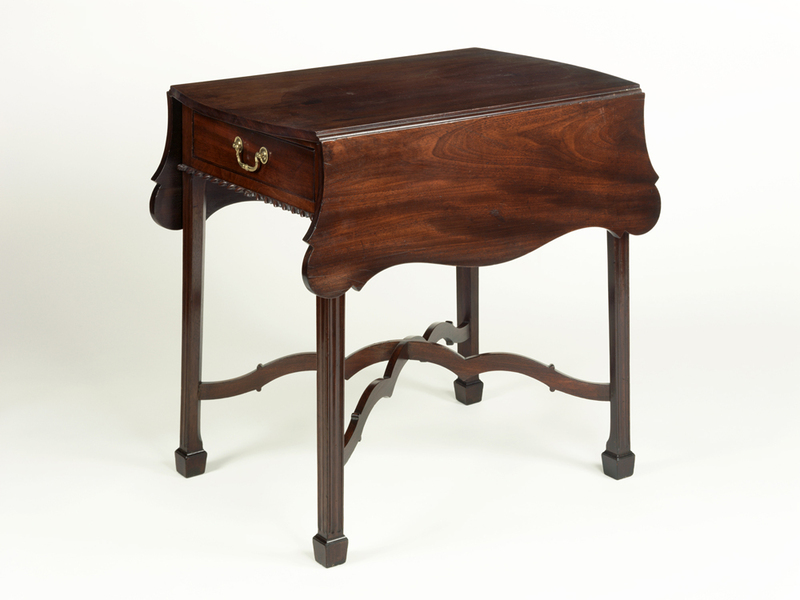 Pembroke table, Adam Hains, Philadelphia, Pennsylvania, 1790–95. Gift of Henry Francis du Pont, 1957.669. High Chest, Philadelphia, Pennsylvania, 1755–75. Gift of Henry Francis du Pont, 1957.506. Miriam and Michael Gratz owned the high chest above. Married in Philadelphia in 1769, their marriage merged two prominent Jewish families that had extensive trading connections. 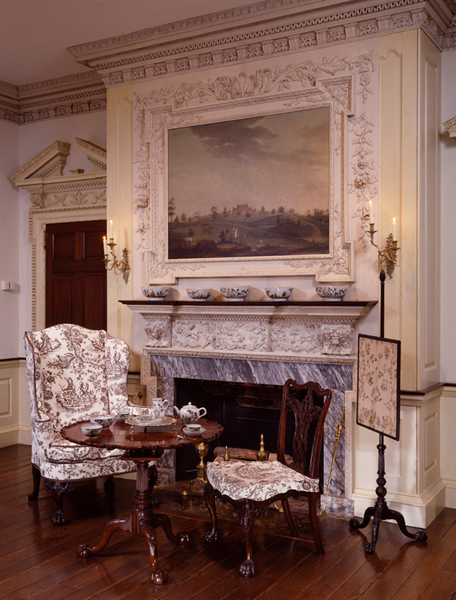 The couple acquired some of the grandest furniture carved in the Philadelphia style of the 1760s. 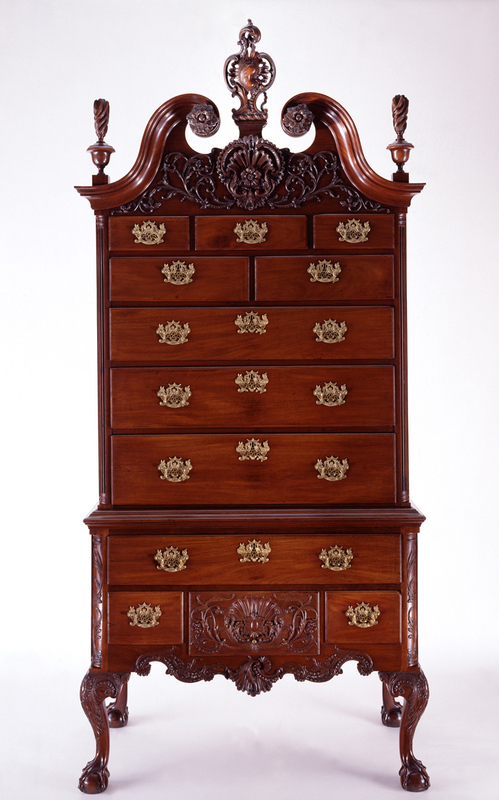 Popularly called a highboy, the handsome mahogany chest of drawers is usually displayed in the Port Royal Parlor at Winterthur. While du Pont enjoyed collecting decorative arts, he also assembled a significant collection of architectural details. 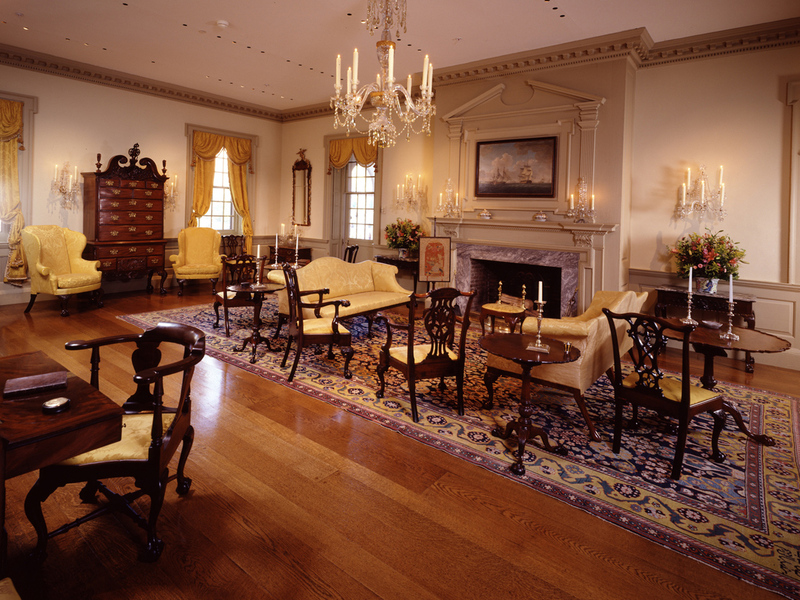 Port Royal Parlor is one such architectural interior that du Pont acquired from Philadelphia and had reassembled at Winterthur. Port Royal was the country home of Edward Stiles, built in 1762, on Frankford Creek, north of Philadelphia. Stiles, a planter and merchant from Port Royal, Bermuda, had prospered in the West Indies trade. The woodwork in the Port Royal Parlor at Winterthur is original to the house in Philadelphia. The architecture in Blackwell Parlor likewise was original to another Philadelphia house at 224 Pine Street. The richly carved doorways showcased in Blackwell Parlor are an outstanding example of 18th-century American architecture. Philadelphia was a thriving city during the 18th century. The number of immigrants from Europe rose quickly in the mid- 1700s. As a result, the need for household goods and the craftsman to make these goods intensified. Later in the 1790s, the city flourished as the new capital of the United States. Even George Washington called Philadelphia home. As the 2104 Furniture Forum made clear, from its colonial beginnings and through the Industrial Age, Philadelphia remained a central hub for the production of fine furniture and carving in America. Mark your calendars for the 2015 Sewell C. Biggs Furniture Forum on March 3–7. For more information, visit winterthur.org/furnitureforum. Post by Hilary Seitz, Marketing & Communication Department, in collaboration with Greg Landrey, director of Library, Collection Management and Academic Programs, and Catharine Dann Roeber, Elizabeth and Robert Owens Curatorial Fellow. This entry was posted in Conferences, Decorative Arts, Furniture and tagged Alexandra Kirtley, Architectural Interiors, Blackwell Parlor, Bridport, Catharine Dann Roeber, Edward Stiles, Furniture Forum 2015, Furniture Forum at Winterthur, Greg Landrey, Hilary Seitz, Historic Germantown, In Wood, Latrobe, Laura Keim, Michael Gratz, Miriam Gratz, Mount Pleasant, Peggy Olley, Philadelphia Furniture, Philadelphia Museum of Art, Port Royal, Port Royal Parlor, Sewell C Biggs, Sewell C Biggs Furniture Forum, Stenton, Winterthur, Winterthur Furniture Forum, Winterthur Galleries, Winterthur Gallery, Winterthur Museum, Winterthur Museum Garden & Library. Bookmark the permalink. Great article. I’m not sure I understand the red pictures, though. Thank you for you comment. It seems when the blog is viewed on different web browsers, mainly Firefox, the images are turning red. We promise it was not our attempt to give the images an artsy spin! We are trying to remedy the issue and hope to have it fixed shortly. Thank you for reading Winterthur Unreserved! I recently come to know your blog. Its really awesome, I really Love the articles. I appreciate your interest in the field of Furniture. clear your head prior to writing. I’ve had a hard time clearing my mind in getting my ideas out. I truly do take pleasure in writing however it just seems like the first 10 to 15 minutes are lost just trying to figure out how to begin. Any recommendations or hints?